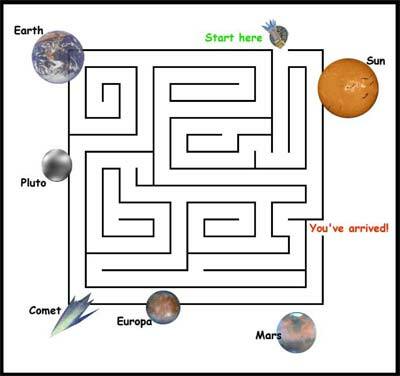 Click here for print-and-do space mazes. If you know anything about the history of computers, you know that they are getting smaller and smaller. Just 20 or 30 years ago, it would take a whole big room to hold a computer with the power of the one you use to look at sites on the Internet. Spacecraft are getting smaller and smaller too. The same new technology that lets computers be so small can be used to make robotic spacecraft very small. We call them robotic spacecraft because they don't carry any people. We send them off to do our work, while we stay home. As long as the spacecraft don't have to carry people, they can be very tiny and still do lots of useful work, traveling far from Earth and finding out all sorts of interesting things about other planets, moons, asteroids, comets, and space. Why do we want spacecraft to be so small? To answer that, which of these boys is easier to lift? Just as a lighter load is easier to lift, a small spacecraft is easier than a big one to boost out of Earth's gravity and send on its way to its destination. That means we can use less fuel and a smaller rocket. Usually, the smaller the spacecraft, the less money it costs to build, launch, and operate, so we can afford do even more space missions. Maybe spacecraft will never be quite as small as the spacecraft in our maze, but soon the entire computer system for a spacecraft will fit on a chip the size of our tiniest maze. Tiny, but mighty . . .
Space engineers are working to stuff more and more of the needed functions for a spacecraft into one little chip. Communications: Receives messages and instructions from Earth and sends data back to Earth. Power: Controls the use of electrical power, charging of batteries, etc. Computer: Runs all the programs that tell other elements of the spacecraft what to do, prepares the measurement data and images (if a camera is onboard) for sending back to Earth, and many other jobs. This mini-chip technology has been used on several spacecraft, including missions going to Pluto, the Sun, Comet Tempel 1, and Mars. Making these tiny chips is part of NASA's "X2000" program, at the Center for Integrated Space Microsystems at the Jet Propulsion Laboratory (JPL). Hear tiny sounds with a Super Sound Cone!